Use your fingers or mouse to control model. Use mouse wheel to zoom it. 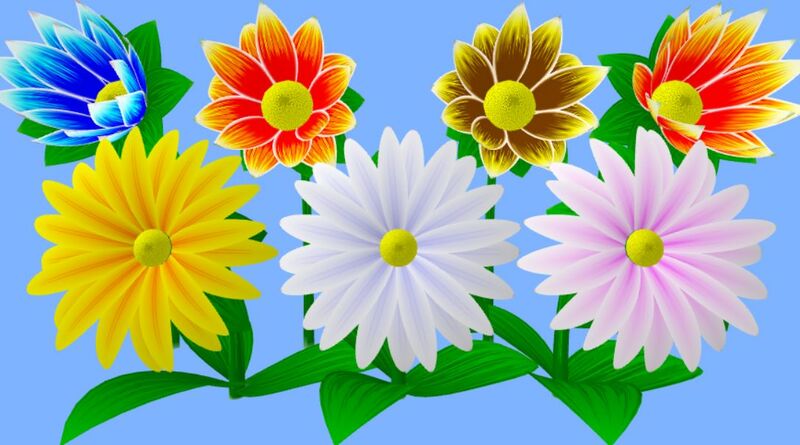 In the right window use mouse wheel to animate flower (change its "age"). Drag slpine control points to control flower shape. Revolution surfaces are used to make procedural petals. The red Bezier cubic spline is the generating r-curve. The blue φ-one determines petal shape. The second (bold curves) basis petal is active for editing. 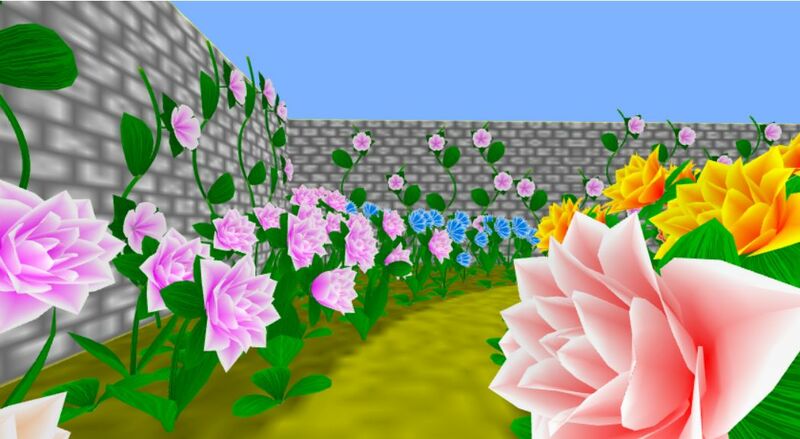 I think now we have enough different flowers to make complex scenes. I'd like to make more realistic flowers in future but it is not very fast for one "gardener". All flowers are free for any use. Cubic Bezier curves are more flexible than subdivision splines (used on the old Procedural Lathe flowers 1 pages). Hope that 4 control points are enough for simple flowers. 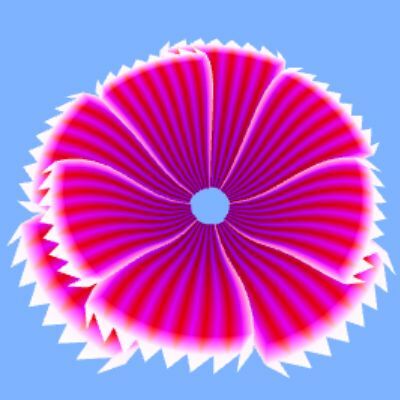 Procedural blossoming (with 2 or 3 key frames) is used for animation and to make many flowers with different ages. Buds are made by rotation, scaling and "age" interpolation of petals, e.g. Procedural textures are made "by hand". Scripts are rather messy. E.g. one can interpolate smoothly base colors for leaf body, top and borders. 16 textures are combined in 64x(64x16) atlas. You can see small defects at petal origin and tip due to mixing of these textures after mipmapping. Ambient and directional (1,1,1) lights are used. Flower stem is controlled by the quadratic spline i.e. two lengths l0, l1 and theta angle (see Rose demo). A few more buds: Weed, Water lily, Tooth, Tooth 2, Apple flowers. Procedural leaves, rose leaves and clover. See also animations on old pages Procedural Lathe flowers 1. Billboard "jungles". To avoid visible walls 2 billboard "jungle" layers (and one backside opaque green wall) are used. 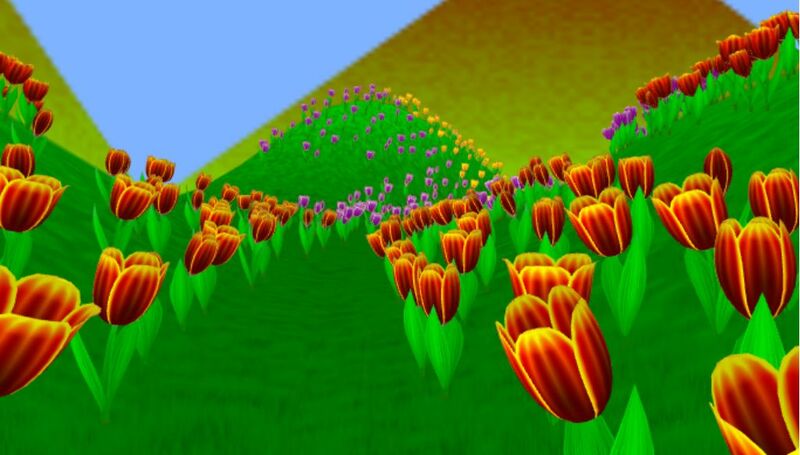 Only one rendering call for all flowers second for billboards and one more for 15 instanced textured grass layers. Terrain with fixed LOD (check "Lines" to see meshes). 1M vertexes are rendered. 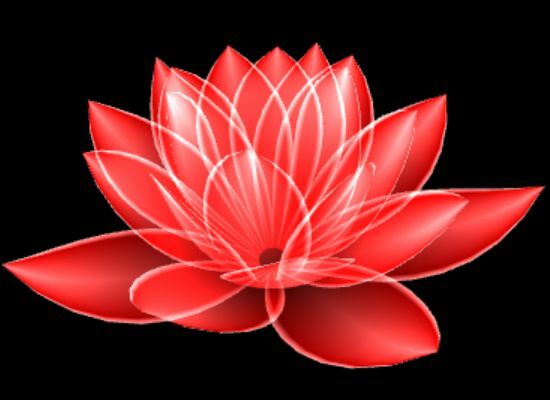 One can use 2-sided petals (texture A-channel is not used yet). Texture array would be more accurate. Also we could use triangle strips for rectangular NxM meshes in WebGL 2. For adaptive LOD I'd like to use patch tessellation on GPU. How to make tessellated surfaces by the compute shaders in WebGL 2+ ? 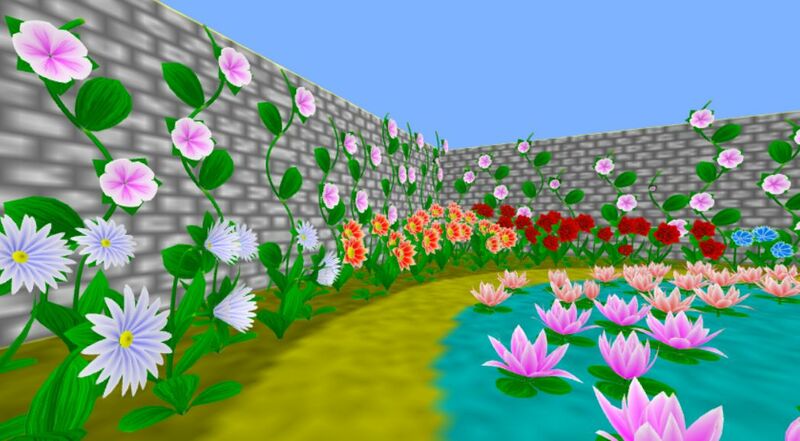 Unfortunately "3D" gardens are too flat on 2D screen. I'm using WebVR-polyfill and Brandon Jones's samples to make true 3D WebVR Gardens. 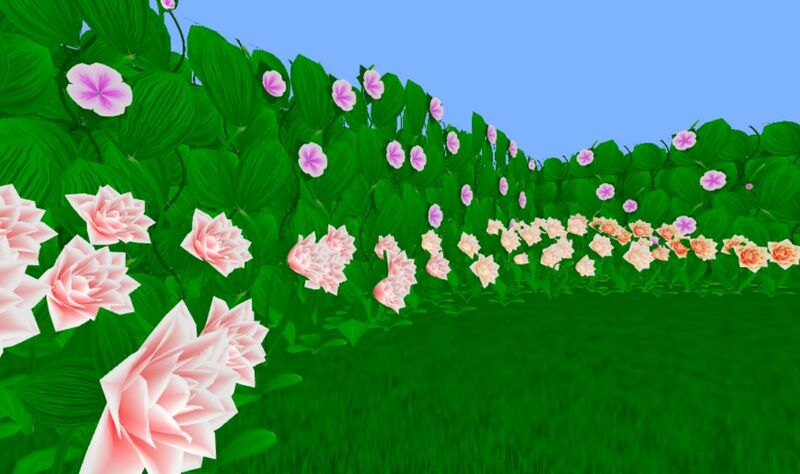 big forms: rose bushes, flower beds, trees? animated butterfly, clouds, water, waterfall ... ?